As our progressive movement gets increasingly savvy with communications, we’ve seen that there is still a need to reach out to and support established organizers who are transforming themselves into communicators. There is something special at PCN that has helped us to develop progressive communicators who have gone on to become leaders in the field. Working with the SiOP constituency, we focused on a population whose voice is the most marginalized in society. 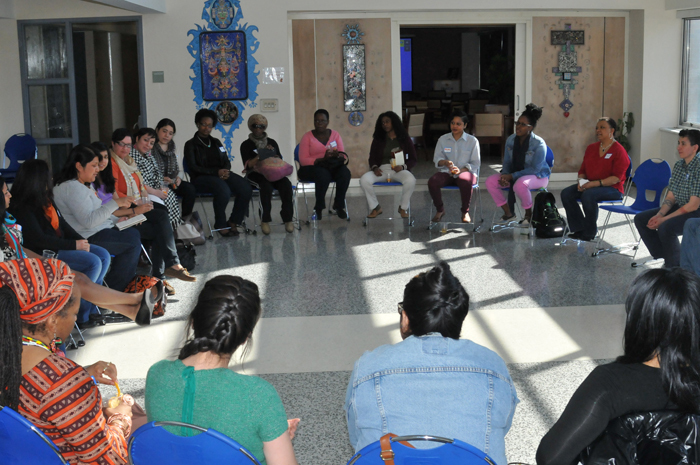 Standing at the intersection of multiple oppressions, women of color leaders are not always supported to share their authentic stories, which hold immense power to transform perceptions and policies. Beyond providing essential training and fundamental tools, our day-long event has begun building a community of practice here in New York. We also challenged participants to reflect on their self-limiting beliefs that so often make them “play small” or remain silent, and to step up and speak their truth using cutting edge communications strategies, social media and more. If you want to see work like this continue to grow, please make a donation today to ensure that we can continue to build this community of women who are interested in becoming stronger leaders and communicators. Your contribution supports powerful networks that are changing how we work for justice and how we communicate a vision for justice. In my first blog about creating cultural shifts, I was adamant about the possibility and the necessity to work toward a cultural shift and my belief it can be done. This includes a cultural shift within ourselves, our organizations, and ultimately our society. In this article, I want to talk about how difficult this work can be. It may seem contradictory to my first blog but the truth is that to facilitate a cultural shift is incredibly hard work, especially when starting with organizations that already have a deeply instilled culture that shapes every aspect of their work. It’s much easier to create a different culture when you are starting a new entity. Unfortunately, when working with a group that has already established a particular way of doing things where leaders act in a certain way and where trust has not been truly built, the work to change is much more difficult. Cultural shifts must start with the leadership but include every individual. It can’t be simply one person trying to make changes. It must include ALL components of an organization: you, the leadership, the Board and the staff. And first and foremost, it must begin with love and trust! At Spirit in Action we realize that “spirit” goes beyond spiritual practice. We can all have a wonderful spiritual practice, meditate together, and then still fall into dysfunctional ways of working together. Spirit in action is about our relationships with each other. It is about practicing love with ourselves, each other, and even those who think differently than us. It is how we do our work, and how we strive to build culture from a positive “what’s working well” perspective. It requires time that we often think we can’t possibly commit to, but putting that time in is what allows our work for justice to flourish and for us to successfully implement changes that work for the greater good. We also have to remember that we all come into our groups with our own baggage: our mistrust, our woundedness and our privilege and/or oppression, and for some of us, a clear understanding that “we know how things should be done”. Often, this is ingrained in us from childhood, and is part of our own personal culture. This limited way of thinking requires doing our own personal work as well as working collectively in order to create a new culture within our work and communities. Make a list of all the positive things that you and your group/organization are doing presently. By focusing on the positive, you can build on what’s working and facilitate successful change. I would love to hear your feedback and your thoughts and questions, as well of some of the positive things you find that are already working for you personally and within your organizations. Please comment below and we can begin to engage in effective and change producing dialogue in order to learn from each other. I appreciate any thing you can share or offer to all of the people reading this today.